Port Town Aero Dive as it appears in Smash. Port Town Aero Dive (ポートタウン エアロダイブ, Port Town Aero Dive) is a stage in Super Smash Bros. Brawl, Super Smash Bros. for Wii U and Super Smash Bros. Ultimate, based on F-Zero GX. It was confirmed on the Smash Bros. DOJO!! on Monday, February 4th, 2008. In Super Smash Bros. Brawl and Super Smash Bros. Ultimate, Captain Falcon is fought here for his unlock battle. Port Town Aero Dive has been faithfully recreated from its original appearance in F-Zero GX. The main platform for this stage zooms along the track, stopping randomly in several locations, each of which has its own terrain. After a certain amount of time has passed, an indicator will appear that warns the players that the main platform will shortly take off, damaging or KOing players that are left behind. The platform will fly around, which allows players to see larger sections of the track, until it lands in a new area. This cycle repeats infinitely. The stage is similar to Mute City from Super Smash Bros. Melee, as it has similar stage hazards in the F-Zero racers, travels and stops at points on the track via a large platform, and is an almost perfect recreation of an F-Zero track. What sets it apart from Mute City is that no two laps in a single match are the same, as the platform doesn't always drop players off at every stop. Another difference between Port Town and Mute City is that the platform in this stage isn't facing forward all the time. Instead, it can rotate 90 degrees so that when it lands, the player is viewing the course from the side. Also, the race cars have become more powerful than they were in Mute City, as they do more damage and can KO around 40-50%, it is impossible to damage them this time around, and they are large enough that characters might be hit by them even if they are standing on platforms floating above the track. The start/finish line. The terrain is completely flat, making it difficult to avoid the F-Zero Racers. The battle always begins at this point. The first corner. There are two parallel platforms here. The ground is at a slight angle. The top of a futuristic freighter. A giant R.O.B. 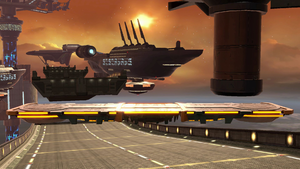 can be seen to the far right of the stage, which also appears in the original Port Town stage in F-Zero GX off of which this stage is based. This area has three platforms. As this area is high above the track, the F-Zero Racers will never pass through this area. The top of a large, hovering disk above the track. As this area is high above the track, the F-Zero racers will never pass through this area. This area has a circular platform in the center, and two hovering platforms above gaps to both sides. If the player tries to land far enough to the left or right, they can find ground at the edge of the disk, but it is easy to be KO'd this close to the edge. The straight with a gap in the middle. There are three platforms arranged in a V-formation above the gap. A boost pad can be seen in the background. This is the section of the stage right before the high jump. Unique to this section is that in the original Port Town Aero Dive stage in F-Zero GX, there is no gap in the center before the jump. The stepped section after the huge jump. The stage is considerably wider than the rest of the stage, and the F-Zero Racers can be seen from a long distance away, making dodging them slightly easier, regardless of the lack of platforms. The area before the vertical piece of the track. The race cars drive in from the right-hand side of the screen. There are also three platforms, making this stop similar to Battlefield. F-Zero Racers can only be avoided by standing on the top middle platform, as cars will still strike on the other two platforms. One important thing to note is that coming into contact with the track itself will damage the characters while the platform is moving. Touching the track below gives average vertical knockback, but can save a character from falling if the platform is near enough to the track. As well as that, the wall that curves around the second corner gives high horizontal knockback and has an extremely high tripping chance. In Ultimate, the F-Zero Racers' knockback has been toned down, now killing around 130%. In Super Smash Bros. for Wii U, the Ω form only features a thicker version of the touring platform with more detail and with the addition of grabbable ledges. It does not stop at any locations on the track. In Super Smash Bros. Ultimate, the Ω form and Battlefield form are set on a version of the touring platform that has additional details and is resized and reshaped to match Final Destination and Battlefield, respectively. It does not stop at any locations on the track. The three soft platforms of the Battlefield form resemble the ones in the normal form. 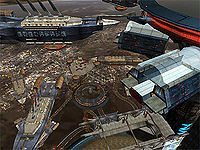 Port Town, as seen from above in F-Zero GX. Ever since the original F-Zero, Port Town has been one of the recurring locations that hosts race courses for the F-Zero Grand Prix, along with Mute City, Big Blue, White Land, Fire Field, and Sand Ocean. In all three of the main games in the series, Port Town has at least two tracks to its name. This particular circuit, Port Town: Aero Dive, is the setting of the second race of the Sapphire Cup in F-Zero GX. The layout and overall design of this stage is nearly identical to how it looked in F-Zero GX, though with additional platforms to facilitate battles. The majority of the F-Zero machines seen in this stage first appeared in F-Zero X and had a graphical update in F-Zero GX; these updated designs form the basis for the machines in this stage. This stage is commonly banned in Brawl due to the randomness of the stage, with players not always being taken to the same stops every game. Additionally, there are overly powerful stage hazards in the cars (which can KO most characters under 50%) which can be difficult to see coming due to their dull colors and speed. As well, the main platform has no grabbable ledges and can be passed through from underneath, allowing some characters, most notably Meta Knight, to freely shark under the stage and edgeguard much easier, while crippling the recoveries of those with weaker or tether based recoveries. The stage has seen very rare usage when Meta Knight is banned, almost always on 7 starter stage lists as a counterpick, but it is usually still near-universally banned. In Smash 4 and Ultimate, the stage has been universally banned for the above reasons, and has seen no major tournament play in either game. Port Town Aero Dive in Brawl. Cars racing down the track and colliding with fighters. Port Town Aero Dive in Super Smash Bros. for Wii U.
R.O.B. taunting in front of the giant R.O.B. on the stage. The lightning boosters placed around the circuit do not actually increase the cars' speed. If the player uses a hacked camera to zoom out on this stage, they will see that the entire circuit is never entirely generated. Only what the player sees while fighting and the next few seconds of track the platform will advance to is what is generated at any one time. A similar thing happens on Big Blue. On all of the stops where the F-Zero racers come in besides the loop, they can be avoided completely if the player stands far off to the side, near the wall of the track (which is also where Pokémon Trainer stands). Even if a player or CPU is playing as Captain Falcon, the Blue Falcon can still be seen driving past the characters during the match. An unusual problem that CPUs have on this stage in Brawl is that they go to the far side of the wall and self destruct after they have KO'd an opponent. The track deals low knockback and cannot KO at high damage percentages, the racers deal high knockback. The opposite is the case in Mute City, with the track dealing high knockback and the racers dealing low knockback. In Ultimate, the game of origin for the stage was changed from F-Zero to F-Zero GX and F-Zero AX. This is the only non-Pokémon stage to have two games listed as the game of origin. Oddly, in Ultimate, whenever a racer hits a character or item, every racer on the track will freeze for about half a second before racing as normal. This page was last edited on April 16, 2019, at 15:31.